It’s not really a home stand in the traditional sense, but the Cubs came back from a 10 run deficit today against the Angels winning 14-13, sweeping 3 games in a row at Hohokam against the SoCal contingent (Padres, Dodgers, and Angels). Today’s game picked up on the excitement of yesterday’s walk off win although the Cubs chances appeared very bleak after Carlos Silva gave up 8 runs in the 3rd inning. Silva can’t look to defensive lapses for this one. In the third inning, Silva gave up 8 hits out of his first 9 batters. The one batter that didn’t get a hit, he plunked. Chris Carpenter relieved Silva inducing the final 2 outs of the inning. James Russell followed with 3 innings pitched giving up 6 hits, 4 runs, 3 of them earned. 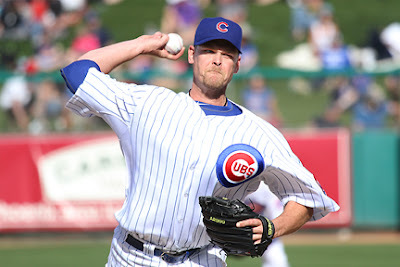 Kerry Wood got a big hand entering the game in the 7th and shut down the Angels 1-2-3, the final 2 outs being K’s, which earned Wood a standing O from the Hoho faithful. Scott Maine threw a scoreless 8th and with the Cubs ahead by a run, Jeff Samardzija gave up a HR to Branden Wood in the 9th tying the game at 13. The Cubs won it in the bottom of the 9th as Fernando Perez walked and after repeated throws to 1st and a pitch out, Perez was able to steal 2nd base. Bryan LaHair came through with a hit to score Perez and the game winning run. 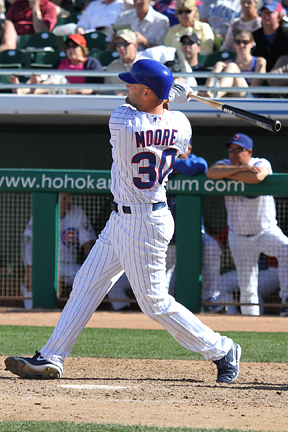 The Cubs pounded out 18 hits in the game, one of the big hits in the comeback effort was Scott Moore’s grand slam in the 6th. 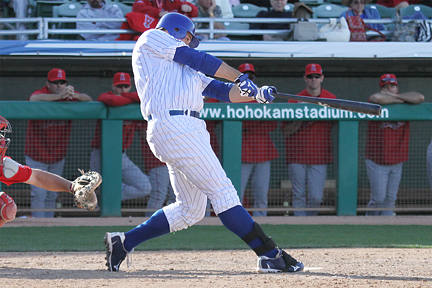 Cubs Catcher Max Ramirez’ also came through with bases loaded, driving a bases clearing double to the gap in the 8th. Marlon Byrd continues to be red hot and is now batting .611 after going 2 for 3 today. 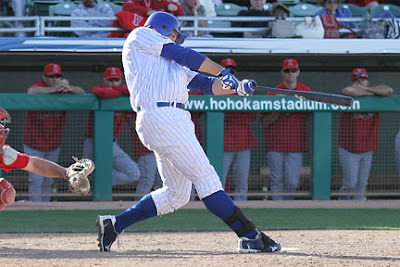 Josh Vitters, Matt Camp, and Max Ramirez all had 2 hits in 3 at bats. Matt Camp continues his diving ways in the Hohokam outfield, this time he was able to come up with a sweet diving grab on an Alexi Amarista liner for the first out in the 6th. Camp would come back later in the 6th with another dive, this one after a Reggie Willits ball that ended up getting past him for a triple. I know it’s only spring training but I can tell you the fans who were around at the end of this four and a half hour marathon were like me, all smiles. The Cubs declared today “ThankYou Mesa Day” and in a pre-game ceremony Cubs chairman Tom Ricketts passed out many gratitudes for Mesa passing Proposition 420 to keep the Cubs spring training here for the long term. This was followed by Mesa Mayor Scott Smith and all 6 Mesa City Council members and and a former Councilperson simultaneously throwing 8 ceremonial pitches. As you might guess, this can be a little bit of a logistical nightmare for the Public Address, not knowing if all the participants are going to make it, et cetera, but it went off just fine. The quality of the 8 ceremonial tosses however was, let’s say, erratic. Cubs fan Tom Deutsch told me he saw the players running at Hohokam and Marlon Byrd was with them but he was walking. So Tom asked ‘Hey Marlon, why are you walking?’ to this Marlon responded “I’m pacing myself…we’re playing in October this year”. I like Byrd’s confidence. BOS game photo’s from our John Antonoff.